Happy New Year all. :-) 2011 is going to be a great year, I can feel it. I'm really going to push myself further this year and tackle areas where I feel I'm lacking in my work (strangely enough, this doesn't just apply to my painting :-p). 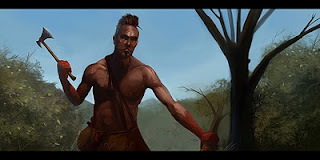 The Huron Scout came out of my love for the Last of the Mohicans film (Michael Mann version) and a study I was doing from some reference for lighting but I wanted to make it more my own so I strayed from the initial image and created my own painting and story. Not my first of 2011 but this is the painting that I want to kick off the new year with. An excellent start to what will be an excellent year! He really pops off the page, and though you have him in moody shadow, the details are crisp and well defined. Very cool subject T. Recommend you grab all the books by Byrne Hogarth. His books really got my head around life art back when I drew. Dynamic Anatomy is a great starting point. Hello Travis, your work is excellent, I've been following you for some time now. I might ask too much now, but would you be interested in joining our SW fanfilm project Armies of Fallen ( info here> http://mksvisualfx.blogspot.com/ ) to create 3 character concept arts? We're in a desperate need of talented character concept artists and we'd much appretiate your help.